Product prices and availability are accurate as of 2019-04-16 15:32:32 UTC and are subject to change. Any price and availability information displayed on http://www.amazon.com/ at the time of purchase will apply to the purchase of this product. (1) 1/2" x 100ft roll of Blue & (1) 1/2" x 100ft roll of Red PEX Tubing for Plumbing Applications. PRODUCT DESCRIPTION: 1/2" PEX Plumbing Tubing (Non-Barrier PEX Tubing) is used for residential and light commercial hot and cold water plumbing applications. Tubing is marked every 5ft with length, ASTM standards, approvals, certifications, pressure ratings and other technical information. WARRANTY: Industry standard, 25-year manufacturer's warranty. APPLICATIONS: 1/2" PEX plumbing tubing is commonly used for: •Plumbing applications (hot and cold water); •Open loop radiant heating applications; STANDARDS, CERTIFICATIONS & APPROVALS: •ASTM F876: Standard Specification for Crosslinked Polyethylene (PEX) Tubing; •ASTM F877: Standard Specification for Crosslinked Polyethylene (PEX) Plastic Hot- and Cold-Water Distribution Systems; •ASTM F2023: Standard Test Method for Evaluating the Oxidative Resistance of Crosslinked Polyethylene (PEX) Tubing and Systems to Hot Chlorinated Water; •CSA B137.5: Cross Linked Polyethylene (PEX) Tubing Systems for Pressure Applications; •ANSI/NSF 14, ANSI/NSF 61, NSF-pw (certified for Potable Water applications); •UPC listed by IAPMO. 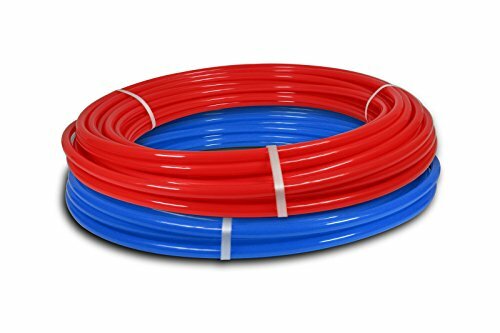 TECHNICAL DATA: PEX type: PEX-b; PEX tubing size: 1/2"; OD: 0.625"; ID: 0.475"; Pressure ratings: 80psi @ 200F, 100psi @ 180F, 160psi @ 73F; Minimum bending radius: 5" (industry standard for 1/2" PEX); SDR-9 dimensional standards; COMPATIBILITY: •Crimp Connection System (Crimp Tool + Crimp Rings + Crimp Fittings); •Cinch (Clamp) Connection System (Cinch Tool + St. Steel Clamps + Crimp Fittings); •Press System (by Viega); •Sharkbite Fittings; •Compression PEX Fittings; •and others. (1) 1/2" x 100ft roll of Blue & (1) 1/2" x 100ft roll of Red PEX Tubing for Plumbing Applications.